Want to become more Christlike in your daily life? Best-selling, father-daughter authors Dunnam and Reisman will help you do that through this 8-week study. 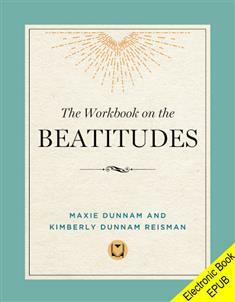 "When we wrote our previous workbook on the 10 Commandments, we intended to add a workbook on the Beatitudes," said Dunnam and Reisman. "The 10 Commandments from Mount Sinai and the Beatitudes from the mount in Capernaum combine to provide a way to be, to walk, and to relate. They offer critical values and principles to guide our every decision." While the 10 Commandments bear the notion of terrible judgment and what not to do, the Beatitudes offer promise and blessedness to the humblest, the weakest, the weariest. Jesus' masterpiece sermon is the blueprint for Christlike living. Journey to the slopes above Capernaum where Jesus delivered history's greatest, most sublime sermon. Be challenged to view the Beatitudes not just as a code of conduct to obey but as ethics of grace leading to kingdom living. Live the lifestyle of the new creation by adopting the true "Jesus way" of life!